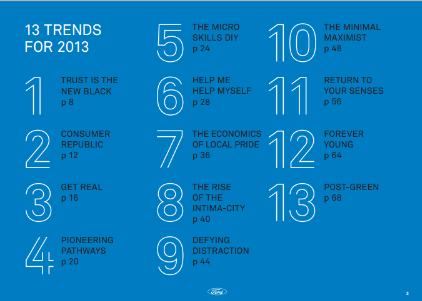 Ford has a very active futurist effort; today for the first time, they offered a public view of their thinking. Ford recognizes that people believe they can do good through their choices of companies to support. For business, this means added importance for corporate social responsibility and diligence in social media monitoring. Customers also expect a more direct relationship with those companies, a trend one analyst summarized by saying, "consumers want to be a market of one." This is a direct tie-in with Infrics' Era of You idea, in which we see personalization of experience at a more and more granular level.